I know, you probably can't believe this has become a trilogy, but it has. I'm hoping this will be the end of it, but I'm sure this is just the tip of the iceberg. I should just get accustomed to having sons who eat nasty things and call it a day. We were having a lovely, expensive lunch during our day at Disney. Our friends from South Florida joined us for our trip. So this event had witnesses. That I will see again. Hopefully. We sat down at our table and immediately Big E pleaded with me for something to eat. He was starving to death right before our very eyes. Even though he had housed a snack size bag of Smart Food popcorn like 15 minutes prior to us being seated. I hastily gave Big E a box of raisins so I could get a whining reprieve. MOM, I HAVE SOMETHING IN MY NOSE. Honestly, I thought he was going to pull out a nasty booger. Cause that's how he rolls. 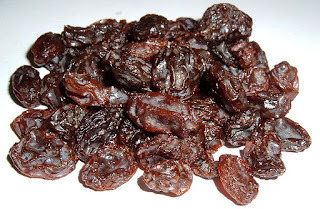 To my surprise, he pulled out a raisin. I half yelled/half laughed because his raisin trick truly caught me off guard. I went back to chatting with our friends. MOM, I HAVE SOMETHING IN MY NOSE, AGAIN. Great, this must be his new schtick. I tilt Big E's head up. I see nothing. This raisin must be lodged in his brain. I immediately panic. My stomach lurches. Thank goodness Mr. Yoy is on it. He grabs a napkin and demands Big E to blow his nose. After three blows, the raisin came shooting out of his nose like a spitball out of a straw. The sound it made will forever be imprinted in my memory. Big E laughs, picks up the freed raisin and, of course, eats it. I'll be pulling these out of Big E's nose til eternity.